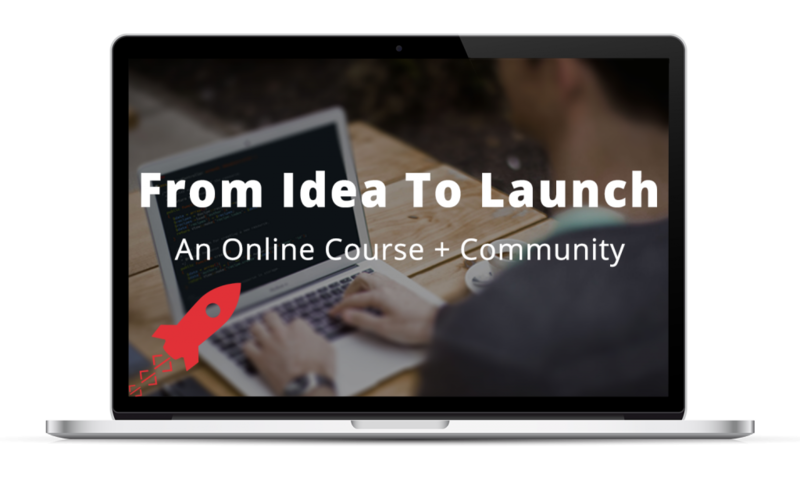 UPDATE: From Idea To Launch is now open! Learn to build a complete Laravel web application, from coming up with an idea all the way through to launching the application to the world. Head over and read all about it now! A month or so ago, I pitched an idea I had for a new course to folks in both our STC community and a few other programming communities, such as /r/learnprogramming over on Reddit. So since that initial, encouraging response I’ve been hard at work, turning those initial ideas into reality. From the start, I knew I wanted to provide a different experience. The other courses and resources available out there just don’t jibe with my approach. And they also don’t seem to align with what you — the self-taught coders of the world — really want in a learning experience. Provide a clear path, and steps to learning. Give you easy-to-follow exercises to come up with your own ideas that will definitely work as web applications. Show you how to build an application, step by step, that you actually care about, based on one of your own ideas. Provide access to help and support from a community that you can lean on throughout the process. And I knew that to include all of those things, the final solution would need to be more than just a course. So that led me to the following conclusion: From Idea To Launch would be both a course and a community. The first, core piece of the experience, though, is still the course itself. Here’s a quick rundown of how the course is structured and what it will help you learn. All lessons are video-based — both recordings of me & screencast-style walkthroughs, which guide you through all of the programming. Each video lesson is ~10 minutes in length — so it’s easy to consume one, or more, in a sitting. Each lesson includes accompanying exercises, to guide you through the steps that are demonstrated in the videos. You’ll learn through a variety of different mediums: pencil and paper for brainstorming and sketching ideas (I’ll even send you your own Field Notes notebooks! ); videos for demonstrations and programming exercises; and worksheets to guide you. And additional resources are provided to help you dive deep if you’re really interested in certain topics. So what’ll you learn throughout the course? You’ll start by coming up with viable web application ideas; and I’ll show you exactly how to do it. Then you’ll reality test those ideas to make sure they’ll actually work as web applications. You’ll pick a single idea. You’ll set up your own computer with the necessary development tools and environment. Then you’ll build that application, based on your chosen idea, from scratch, step by step. And, last but certainly not least, launch your new application for others to use. I’ll also be going through the entire process own my own, along with you, building and launching my own, real-life application. And when you’re learning any new skill, it’s crucial to always know where you stand. When you’re learning a new skill — especially something as in-depth and involved as learning to build a web application — it’s really important to always know where you stand, in respect to the overall process. So, with that in mind, the course will include a dynamic, visual “Performance Path Map” (a term coined by Kathy Sierra in her book Badass: Making Users Awesome) that depicts all the course lessons, indicating where you’re at in the process and which lessons you have, and have not, completed. You can think of it as a visual chart that shows your rise from the beginning topics (e.g. coming up with your web application idea) all the way through to the advanced topics (e.g. launching your application), and depicts all of the skills you’ll learn at each step along the way. 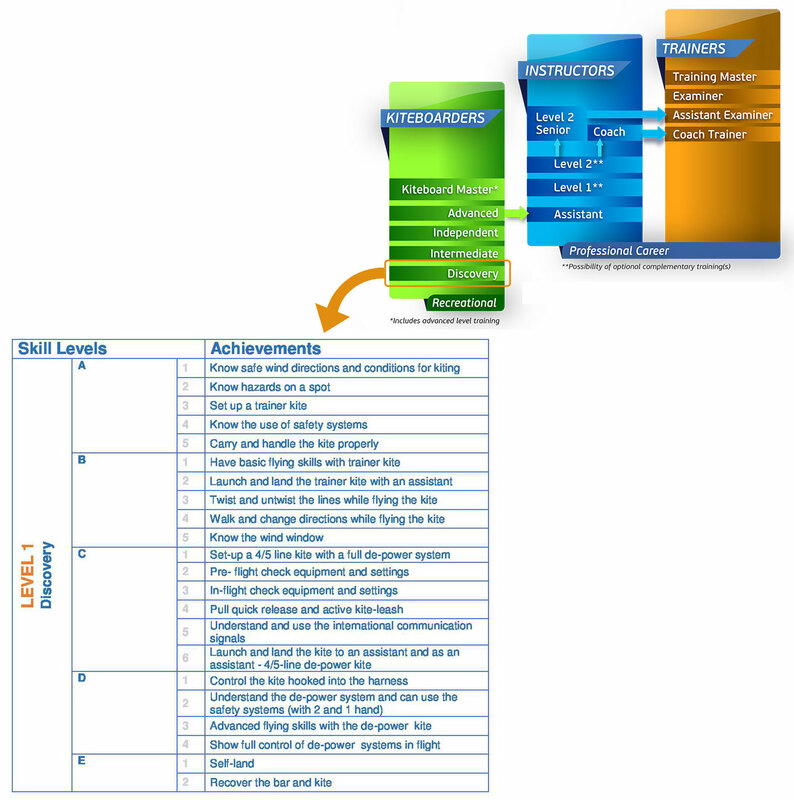 An example of a Performance Path Map for one of the International Kiteboarding Organization’s training courses is shown below. The course will also help you stay on track and progress as fast as possible, without missing a beat. It can be hard to stay on track. And that’s exactly why I have features built into the course to help you stay accountable and ensure you’re always moving forward, as quickly and efficiently as possible. And as you grow and progress, so will the course. Another unconventional aspect of my approach is as follows: this course will grow along with you. I have the overall course mapped out, with all of the lessons outlined. But I’ll be producing the lessons over time (i.e. they won’t all exist right away when the course launches); I’ll add 1-2 new lessons per week. The course will launch with at least 6 lessons, so you’ll have plenty to dig into right off the bat. Why take this gradual-release approach? It allows me to get the course into your hands as soon as possible, because all the lessons don’t have to be created ahead of time. I’ll always be taking feedback, and, this way, I can take all of that feedback into account and improve and adapt each and every new lesson to be as awesome as possible. So the course will always be improving, all the time. And it will grow along with you. After all, you won’t need to access the 25th lesson right away, but there will always be enough new content for you to keep moving along. Like I mentioned, From Idea To Launch (FITL) isn’t going to be just a course; it’s also going to be a community. In other words, the community piece of this is not just a fluff addition so I can add another item to the “Here’s what you’ll get!” list. It will have a huge impact on your overall learning process, and it will serve to make your learning experience much more enjoyable and fruitful. The last piece of the experience — an extension of both the course and the community — is the live monthly workshop series. It’s been a long time coming, but through years of experience, extensive research, and many, many chats with folks like you, I think I’ve finally settled on a learning experience that I know will be effective. You’ll always know the next step to take. And you’ll always have a community to reach out to for support.